All Princeton homes currently listed for sale in Princeton as of 04/20/2019 are shown below. You can change the search criteria at any time by pressing the 'Change Search' button below. "This is one of Princeton's most beautiful remaining tracts of land offering spectacular views of and access to Lake Carnegie in the coveted Riverside section. 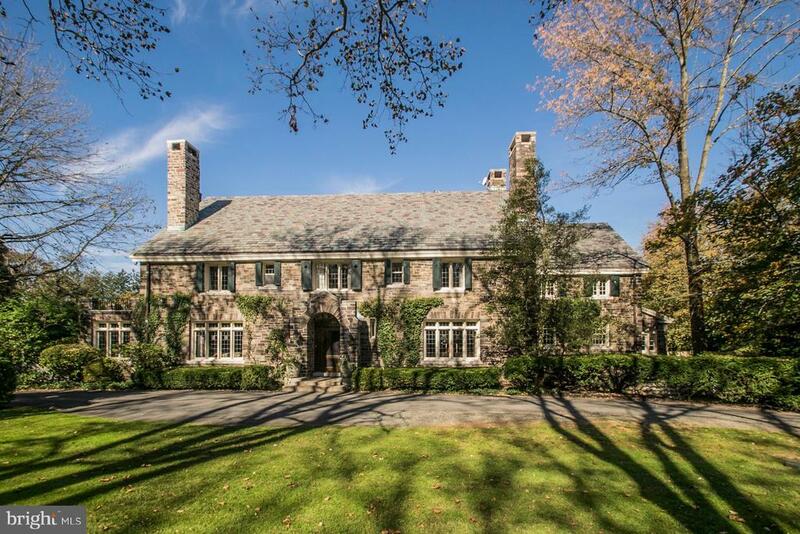 Originally a private residence, this gracious stone-sheathed manor home was built in 1914. When the non-profit research firm, Textile Research Institute, sought expansion and closer collaboration with universities after World War II, it purchased this estate in Princeton, a town which was attracting many new research and development companies. TRI-Princeton preserved the stately residence creating within its walls meeting rooms and offices, and the institution has remained a responsible caretaker for this beautiful estate for the past 70 years. The estate's land, originally including more acreage, now encompasses 18.47 acres featuring groves of specimen trees, broad expansive lawns, and a gentle slope to Lake Carnegie. The property is zoned R-5, which allows for the creation of 1/2 acre lots and is easily accessible with broad frontage on both Riverside Drive and Prospect Avenue. The stone manor house can be re-purposed once again or removed depending on the vision of the purchaser. The possibilities are limitless." "Renovated with bold vision and a profound respect for the past, the historic Pyne Mansion is truly an exquisite home. This turn-of-the century, Jacobean-style manse has a sterling architectural provenance, with its original design by Raleigh Gildersleeve, the celebrated architect behind many of the buildings of Drumthwacket and Princeton University, and an award-winning renovation headed by architect David Abelow, a former protege of I.M. Pei. A striking metal and glass staircase dramatically centers a series of loft-like spaces that have been meticulously renovated and updated to perfection by an extraordinary slate of designers and artisans. The heart of the home is the great room/chef's kitchen, whose modern design features a vast stone-topped island and abundant cabinet space. Entertain without limits in a spacious and elegant dining room, hand-troweled with a Venetian plaster facade atop a backdrop of exposed brick and enclosing a hidden china cabinet. After dinner, spend the evening in the incredible lower level, sampling the offerings of the 4000-bottle wine cellar in the adjacent lounge, and perhaps watch a film in the state-of-the-art theater with a 15-foot Cinemascope projection screen. If quiet is what you seek, restful grounds are celebrated by a 2-story conservatory of Honduran mahogany, and a rear loggia topped with a custom iron canopy and antique corrugated glass that formerly graced the greenhouse of the Brooklyn Museum. A translucent floor lights the way to the bedrooms. A double height master bedroom with his and her dressing rooms, loft and exercise rooms is spectacular as is the 2nd floor lofted studio space. 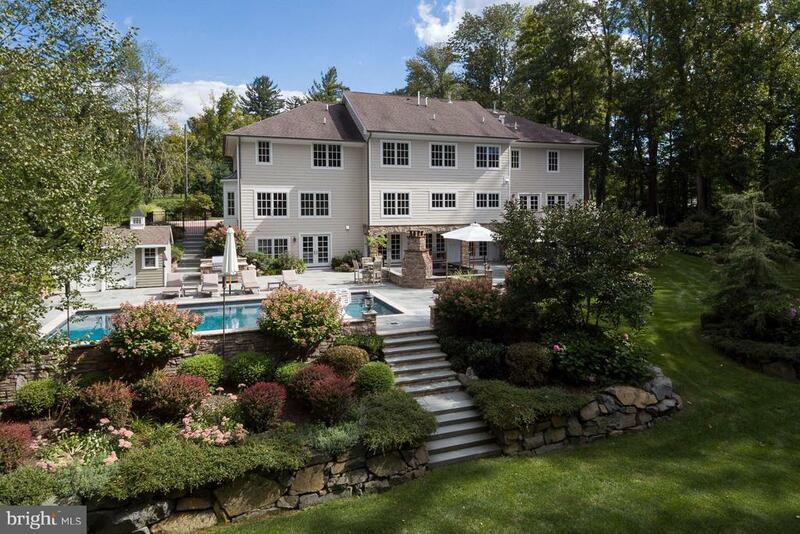 This impressive residence is within 1.5 miles of downtown Princeton." "Once-in-a-lifetime magnificence. Presiding over an expansive cul-de-sac setting of just 6 estates, Stonybrook Manor pairs European craftsmanship and every contemporary comfort to create a true masterpiece. Graceful Georgian lines are traced with matching brick, while inside, every detail is better than the last: from custom millwork that includes 6 one-of-a-kind, carved fireplaces, to a spectacular entertainment level, and on to a waterfall pool embraced by bluestone patios and porticos. The entrance hall and its commanding butterfly staircase lead through arched pocket doors to a banquet-style dining room and holiday-sized living room. The library is stunning, wrapped in richly-hued hardwood built-ins that also match an outfitted butler~s pantry, breakfast room with a ceiling-high buffet, and the sweeping gourmet kitchen, just perfect with professional stainless appliances, a vast granite island, and connecting family room. Upstairs, 7bedrooms are arranged for flexibility and privacy. The multi-room master and luxury bath are breathtaking: relax and rejuvenate in the sauna, on the private deck, or fireside in the sitting room. As finely finished as the upper levels, the lower level houses a theater, game room, and a mirrored gym with a nearby full bath. Included in the sale is a coveted membership to Jasna Polana Golf Club, just across the way." "Custom-built with every imaginable luxury, this nearly downtown Princeton estate elevates day-to-day living to an artform with 3 levels that dazzle at every turn. Spaces are as comforting as they are impressive, with lyrical millwork,exquisite finishes, and modern comforts like an elevator, a dumbwaiter and digital controls throughout. The trussedcathedral kitchen is so much more than a place to craft a meal, thanks to its bespoke cabinetry and remarkable LaCornue enamel range; the adjoining sunroom/breakfast room and family room open to a covered terrace. Richlypaneled, the fireside library hosts the after-dinner hours in style. 5+ bedroom suites include one with a kitchenetteand sauna, currently used as a gym/spa, and the master - palatial get-away with its own fireplace, marble-sheathedbath, and boutique-style dressing room. An incredible entertainment level must be seen to be believed,encompassing a full catering kitchen, dining room with a wine cellar, and a spectacular award-winning home theater.2+ acres hug resort-style patios and a 4-bay garage. A home like no other!" "This one of a kind Custom Built (2009) Contemporary Craftsman waterfront property situated along Carnegie Lake harmonizes modern opulence with timeless authenticity. The open floor plan 5 bedroom, 4 1/2 bath home claims a fabulous location in the coveted Riverside neighborhood of Princeton offering 6,000 square feet of awe-invoking living space replete with rich woods, gleaming bronze accents, and soaring cathedral ceilings. Upon entering the home, you are immediately drawn beyond the foyer into the magnificent great room where you get your first view of Carnegie Lake in all its glory; calm waters lay just beyond lush greenery, view-able from the tremendous windows that line the back wall. The first of 3 custom masonry fireplaces is a focal point of the space, adding warmth to the grandeur, transforming it into the perfect place for family and friends to relax. Eucalyptus hardwood flooring, warmed from radiant floor heating found throughout the home, glows in the sunlight as it leads you from the family room to a true chef's kitchen. It's hard not to picture yourself spending the holidays here, where the pristine 48 stainless steel Wolf range, Miele speed oven and steam oven, Sub-Zero refrigerator, 2 dishwashers, and wine fridge would be put to good use. Access to the elegant upper deck with Brazilian Cherry wood and stainless-steel cables can be found at the edge of the kitchen, where you can watch the sun set over the lake year-round. The main floor is also home to a library with custom built-ins and fireplace, a spacious laundry room with over-sized Miele washer and dryer, and the impressive master bedroom with luxurious en-suite bathroom and immense walk-in closet with custom built-ins. Two additional bedrooms, one overlooking the lake, share a luxurious full bath on the homes second floor. The ground floor includes a 4th BR and grand family room with fireplace and French doors that open onto the bluestone patio just steps from the lake. Additional highlights of"
"Luxury meets history in this elegant fieldstone home. An extraordinary restoration imparts a distinctly modern sensibility to the compelling architecture of this Johnson & Johnson legacy home, a restored Normandy manor masterpiece designed in 1925 by celebrated architect, Ernest Flagg. Highlights include, a beamed Great Room with a trio of French doors to a house-wide bluestone patio, a fireside billiards room, and stunning den with a soaring 6-foot copper sheathed fireplace mantel. Every single detail of the dream-worthy Christopher Peacock kitchen dazzles and delights; an island of Calacatta marble with walnut prep area, chef-caliber appliances and butler's pantry. Each of the five bedroom suites features sumptous bathrooms, including the master sanctuary with a marble bath, fireplace, and 700 square foot private terrace. Perched above the 5 car bays, the renovated Carriage house offers the ultimate flex-space for a guest apartment, art studio or office. 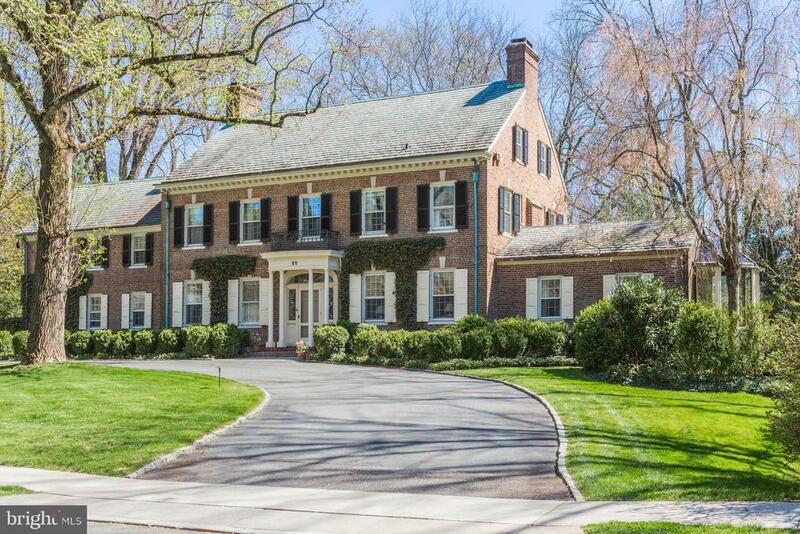 Equidistant from Philadelphia and Manhattan, close to major airports, prestigious Princeton University, the area's finest shops and eateries, this is urban estate living at its most sublime." "This 9,000 square foot colonial-style mansion in Princeton, New Jersey was constructed in 1998 by famous architect, Gabriel Kellner, exclusively builds upscale dream homes with classical design and outstanding build quality. The mansion sits on a sprawling 1.68 acres of private, fenced-in land secured by a stately, gothic-style iron gate. The beautifully landscaped property is situated within 68 acres of Nationally Reserved virgin forest. Though located in perfectly-preserved nature with the utmost privacy, the property is also conveniently located minutes from Princeton University, Downtown Princeton, and NJ Transit as well as a short drive from New York City and the Jersey Shore. Shopping malls, various restaurants, and supermarkets are also within easy reach. The spacious house contains 35 rooms, including a grand two-story foyer, 6 bedrooms, 5.5 bathrooms, two beautiful staircases in the front and rear, formal living room, dining room, family room, breakfast nook, kitchen, wet bar, library/office, game room, wine cellar, 150 inch 3D movie theatre, billiards/ping-pong room, fitting room, and three-car garage with additional storage space. The property comes equipped with intercom, music, and smart security surveillance systems. Outdoor amenities include a well-maintained standard-size tennis court, a rectangular 40'x20' swimming pool, a huge wooden deck, a stone patio, and an English garden with gazebo. Ancient boulders accent the property, a legacy of the ice age that shaped the surrounding landscape. This plethora of amenities puts you in the serenity of nature while lavishing you with modern comforts, much like your very own vacation resort. Princeton was named one of the best places to live in America in 2016. As the cherry on top, the property lets your youngster attend Princeton Public Schools, the best ranked in the nation." "What gives this Hodge Road house its undeniable air of dignity? Perhaps it's the leaded windows accented with stained glass, the paneled wood doors with hefty wrought iron hardware or the solid stone walls built from the very same material used for Princeton University's world-famous buildings, which happen to be just a half-mile away. Since its completion nearly 100 years ago, five generations have lived happily under its slate roof. From the gleaming oak and Mercer tile floors to the coved and coffered ceilings, every inch within has been lovingly maintained. The main hall, crowd-friendly formal rooms and paneled library remain as warm and welcoming as they've always been, while the kitchen and former servant's spaces have been modernized and opened up to create a large, laid-back gathering area with French doors. Stretching out from the terrace, half shaded by flowering wisteria, a deep lawn edged with perennials culminates in a koi pond, once the site of a picture-perfect wedding. One of two side lawns hosts the aqua-blue pool. Enjoy water's therapeutic benefits any time of year in the intimate garden room with trickling fountain. On the second floor, there are three marble-tiled bathrooms serving six bedrooms, many with fireplaces and terrace access, plus the laundry room and a linen room lined with built-ins. A separate apartment is completely updated, wonderful for a nanny, caretaker or extended-stay guests. Untapped space in the full attic and basement can accommodate any unmet needs. Original amenities, like the telephone booth and hand-cranked firewood haul, may spark conversation about bygone days, but this house is prepped for the latest systems and ready to serve the next five generations with distinction and grace. 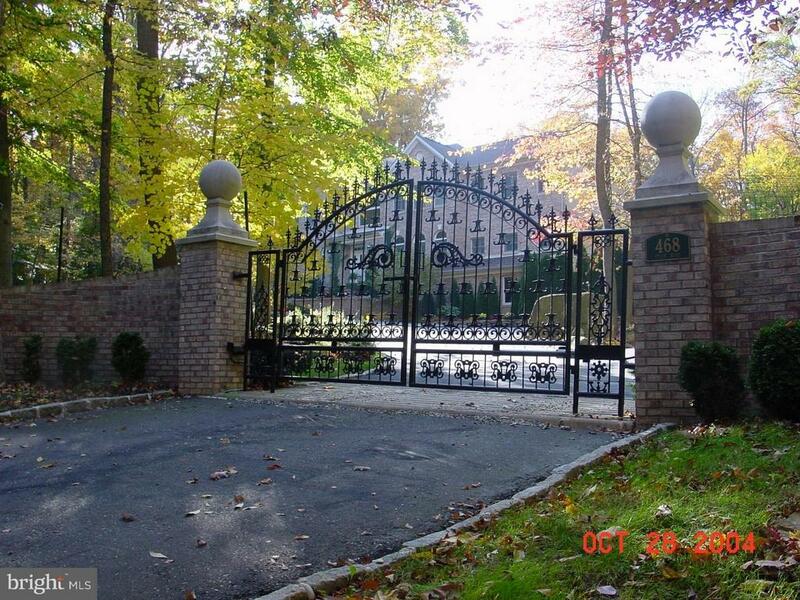 Owners are NJ Licensed Real Estate Agents." "Built in the 1930's, this classical brick in-town residence has been masterfully restored to perfection offering all of today's conveniences and expanded with a fabulous post-modern addition with architecturally well-integrated spaces. Approached through wrought iron gates and a circular driveway, this beautifully positioned house is surrounded by majestic specimen trees, perennial gardens, stone walls, expansive blue stone terraces and a secluded tennis court. A gracious entrance foyer with arched doorways and deep-set moldings introduces the well-proportioned rooms throughout the house. Enter into the elegant sunken living room with high ceilings and views of the gardens through multiple French doors with transoms. Nearby, a spacious dining room with numerous custom plaster details is sure to make your holiday dinners memorable. The original library and study adjoining a hearth-warmed sitting area with window seats and built-in bookcases was the site of numerous historic meetings during WW II. The dramatic addition includes a pyramidal skylight over a spacious, sun-drenched breakfast/family room with an exposed brick wall tying the two-story stair tower to the main house. Adjacent, a well-appointed kitchen with a large center island and top-of-the-line appliances is awash in light with a huge skylight crowning the space. Upstairs, the sumptuous master bedroom features a vaulted ceiling with cove lighting, a fireplace (one of four), lavish his-and-hers bathrooms and dressing areas. A skylight above a spiral staircase connects the attic guest bedroom suite to the second floor via a dramatic, enclosed glass-block wall. Uniquely sited on an acre of land on a private cul-de-sac backing up to 10 acres of woodlands, this home is one of Princeton's few luxury properties from which one can walk into pristine countryside from its back door and into town from its front door. 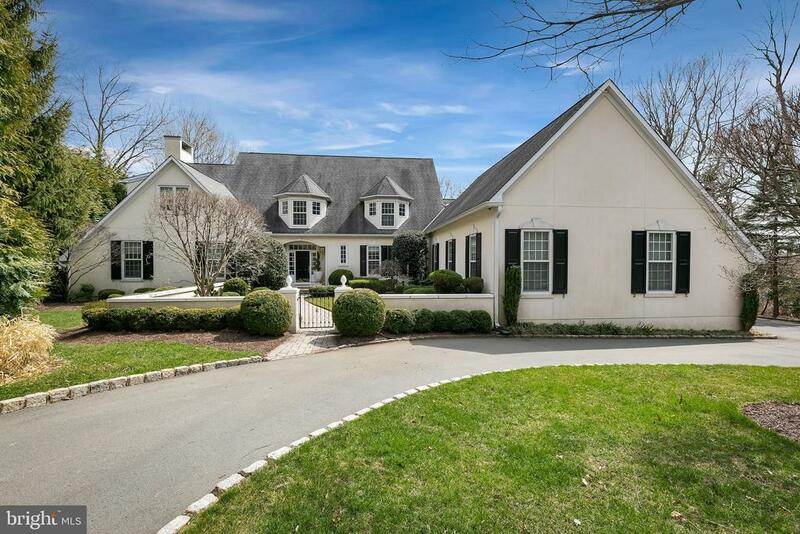 It is a tribute to the craftsmanship of yesteryear with all the modern amenities coveted by today's b"
"A Hidden Princeton Gem: Sitting on 3.9 serene acres, this Luxury Estate invites you to own a piece of greatness. 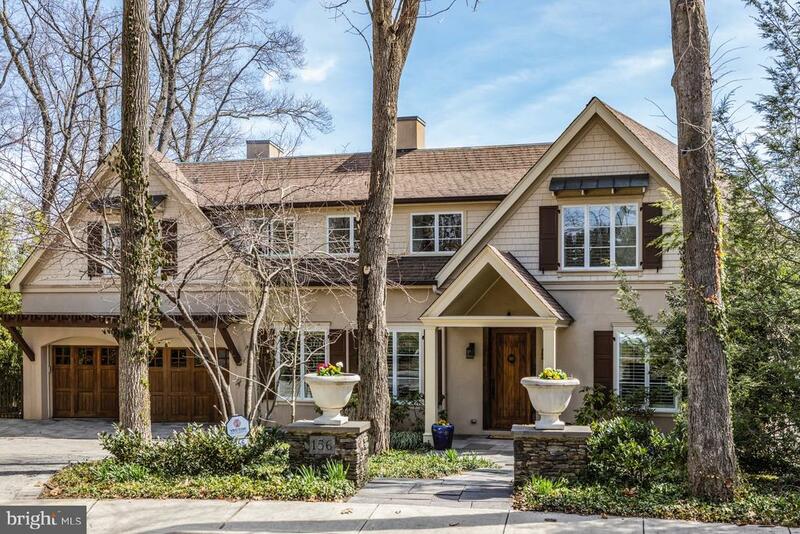 This Young, All-Brick, Georgian Colonial home was built by Kerani Enterprises & designed by Andrew Outerbridge in 2000 with 7,853 interior square feet on 3 levels and additional finished 2,376 at the lower level. 10,229 Total Finished sqft. Surrounded on three sides by forest, it offers an arboretum-like natural preserve. Near the 15th hole of the world-renowned Jasna Polana Country Club, this estate's long and grand entrance is designed to inspire your visit. With its center hall staircase and its 2 story foyer, it is sure to please those welcomed to your home. Custom kitchen with granite wrap-around & center island capped by a hand-painted & tile inlay masterpiece. Four gas fireplaces throughout the home surrounded by a selection of wood, marble or carved mahogany. Six bedrooms on the two main levels and fully finished 3rd level, currently configured with 2 additional oversized bedrooms - and intelligently designed to support a multitude of alternate interior configurations to support your expanding lifestyle. The vast lower level serves as recreational space for all imaginable uses- currently wine room, home theatre and gym (included) - or can be converted back to the Au Pair's quarters. Open wide the patio doors from the Kitchenette to access the lower patio and inground pool - most ideal for the best of outdoor entertainment. The upper patio peers off the family room accessing a full view of bursting colors of the seasons, sounds of nature and that breath of fresh air. The upper patio has catered comfortably to large formal gatherings and casual get-togethers. Oversized Four Car Garage & inside access. Tucked away & Picture-Perfect year-round, this home has provided joy and contentment for many. And it too can be for you." "Sitting on a knoll atop the Princeton Ridge, this lovely home takes it's cues from the French countryside. Highly customized details throughout create one-of-a-kind spaces with sophistication and elegance. Venetian plaster, hand-painted finishes and Cotswold stone tiles beautifully complement the foyer. The soaring living room and gallery is the home's crown jewel with a spiraling staircase, limestone fireplace and columned arches, a motif repeated throughout the home and entertainment terraces. Morning sun lights the Christopher Peacock kitchen and 300-year hand-made French tiles, which open to a great room with a second limestone fireplace. A butler's pantry and 1,000-bottle wine cellar beckon to entertain under the dining room's beautifully detailed ceiling. An au pair suite, guest suite and library, are totally separate from four upstairs bedrooms. All of the bathrooms are sparkling and tastefully timeless, including the master suite with hand-painted furniture-style vanities. Impeccably maintained, this home is in move-in condition." "The graceful, old-world atmosphere of this Tudor home is totally in keeping with its prestigious address in Princeton's Western section. Rooms of elegance and style are highlighted by lustrous wood and bluestone flooring, barrel vaulted and beamed cathedral ceilings, and decorative cast plaster moldings. Casual and formal living rooms sit beside one another, each with a fireplace, and separated by a wine room and an elevator that connects 3 floors. The library links via an arched door to a private courtyard. Both a butler pantry and the pro-style kitchen open into the inviting family room and formal dining. Designed with fitness in mind, the lower level features a gym and half bath. Two upper floors are devoted to peaceful rest with lovely en suite bedrooms. His and her bathrooms in the master suite are geared to pampering with heated floors, a jetted tub, and marble steam shower. Two professionally designed dressing closets are luxuriously outfitted. In the garden, awash with greenery, find specimen plantings and a 4-car garage." "For buyers who refuse to compromise, this completely rebuilt home deftly walks the line between town and country, traditional and modern. 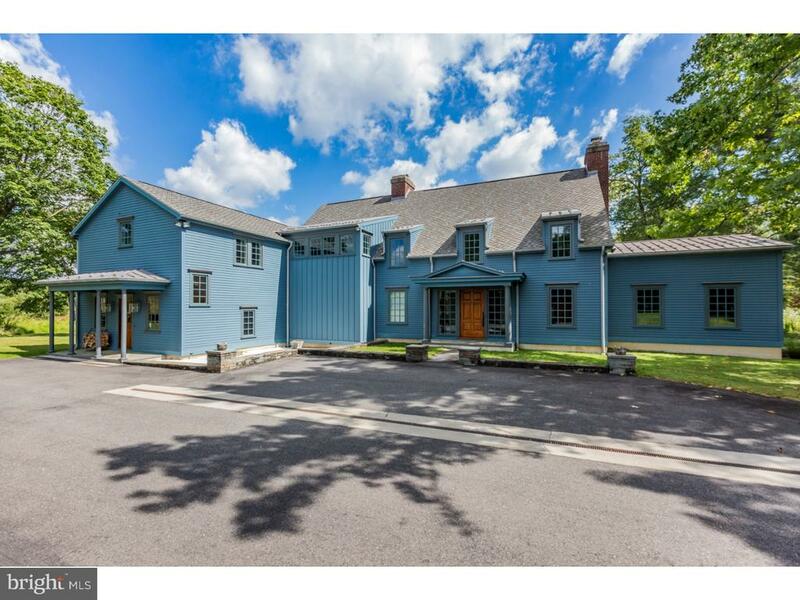 It is purposefully angled on 3+ acres to maximize privacy and everlasting rural views, yet right at the driveway's end, sidewalks lead into town and straight to the Princeton Day School campus. The long entry hall, more of a room than a passageway, shows off a herringbone oak floor, French doors crafted from exotic hardwoods and the striking combination of a classic staircase and contemporary lighting. The sunken Great room, the quiet study and the bright, corner family room all have distinct fireplaces that keep these large spaces feeling cozy. Lacewood oak, Brazilian marble and metallic Italian tile bring unique texture and sheen to the open, commercial-grade kitchen. Of the five beautiful bedrooms, the master stands out in both appearance and amenities: custom walk-ins, a marble-clad bathroom with circular shower, operable skylights and a sundeck with unparalleled panoramic views, just to name a few. Pool is being sold in as is condition." "Unsurpassed panoramic views of Lake Carnegie shimmer throughout this impeccable Riverside home. Enjoy watching American Bald Eagles fishing in your backyard. 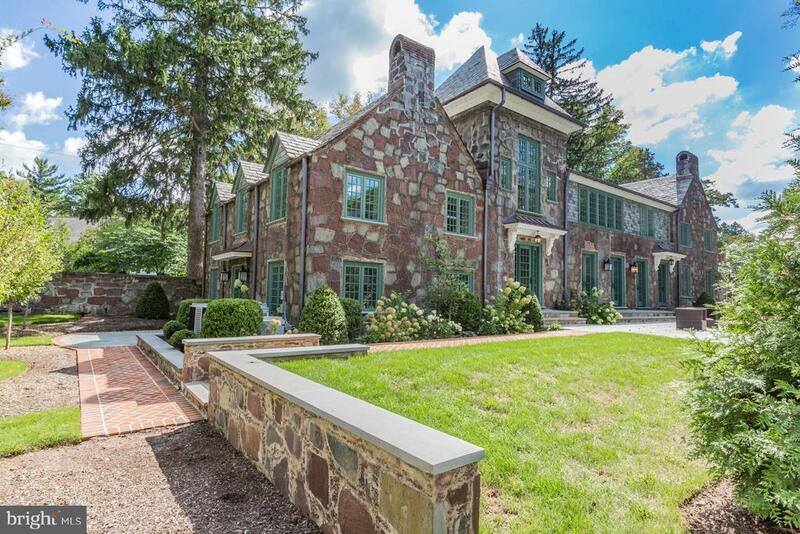 A 2004 transformation by builder Lewis Barber, renowned for his fine craftsmanship, has created one of the finest and most private lakefront homes in Princeton. Hardwoods, extensive windows, and custom built-ins fill every room with views and warm sophistication, from a front-to-back living room, 2-story dining room, fireside Great Room, and gourmet kitchen, with stainless appliances, glistening granite, and butler's pantry. Appreciate the glorious vista from the deck, tiered bluestone patios, and private dock, surrounded by established gardens. A large family room anchors the walk-out lower level, while the bedroom suite is sure to be every guest's dream. 3 of the 4 upstairs bedrooms showcase spectacular lake views, including the luxury master with a stone en suite. Wonderful extras include a state-of-the-art, indoor/outdoor sound system, back-up generator, geothermal heating and cooling. Located on a quiet cul-de-sac just 7 minutes away from the train." "Luxury town home living in the prestigious Residences at Palmer Square. Entry foyer leads to spacious living and dining rooms, with adjacent kitchen perfect for entertaining. The chef's kitchen features built-in Viking appliances and designer selected granite and natural stone. The second level is devoted to the master suite. Also on this floor is the den and laundry room. The third level offers two en-suite bedrooms. The forth level's upon sunlit loft can be an additional bedroom, spacious home office or media room. An additional bathroom is on this level. The elevator services all levels, plus the full unfinished basement. There is a powder room on the main level for convenience. Images and virtual tour represent several models available at The Residences At Palmer Square. Sales office is located at 22 Paul Robeson Place." "This stunning custom home offers three levels of perfection on a manicured haven of over an acre in the beloved enclave of Edgerstoune. Feel cocooned from the outside world beside a sparkling swimming pool, two bluestone patios with an outdoor fireplace, lush gardens, and sport court. Professionally decorated interiors speak with a luxurious elegance in bespoke millwork, hardwoods, and fine finishes, from a gracious entrance hall, coffered dining room and library, and a family room framed in a fireplace and French doors. A gourmet kitchen fulfills the chef's dreams with two complementary colors of granite and cabinets, a 6-burner Viking range, wet bar...the list goes on! An office suite pinch-hits for guests, who will be thrilled to visit the lower level's full-service kitchen, mirrored gym, bath - even a suite for sleepovers. Upstairs, a wide loft has built-in desks - a fantastic space for the younger set. 4 bedrooms include a majestic, multi-room master suite, complete with a boutique-style walk-in and a shoe closet. Moments to Nassau Street. *New, reduced tax assessed value for 2019 is $2,294,900. Based on 2018 tax rate of $2.332, 2018 taxes would have been $53,517 at this new assessment." "Noted 19th century architect, Richard Morris Hunt, perhaps most famous for designing The Breakers in Newport, R.I. and the pedestal of the Statue of Liberty, is the artist behind this breathtaking Library Place estate. 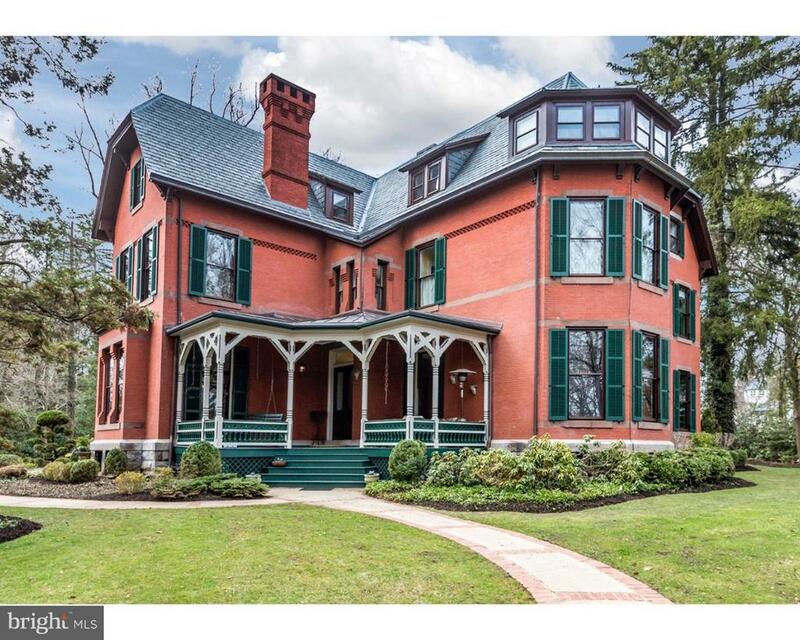 Built in the 1880's as a gift to a Princeton Seminary dignitary, this grand home has been beautifully brought into modern day living and is ideally located a block from town center, close to McCarter Theater and the Dinky train. A symphony of period details sing through 3 floors and 6+ bedrooms, warm with original hardwoods, 9 fireplaces, and natural light flowing through over-height windows. Ceiling heights soar with 11.5 ft. on the first floor, 10.4 ft. on the second floor and 8.6 ft. on the third floor. Very gracious formal rooms like the library, dining room, and living room, are dramatic with high ceilings, intricate ceiling medallions, and exquisite millwork that includes chestnut pocket doors. The spirit of the home is modernized in the renovated dream kitchen, anchored by a gazebo breakfast room addition with 360 degrees of windows; a 2-sided fieldstone fireplace connects to the family room and a wet bar. Completely repointed, the brick facade perfectly counterpoints the expansiveness of its manicured corner lot." "In the heart of a wonderfully established Princeton neighborhood, 4+ gated acres vibrant with century-old tulip and oak trees, masses of rhododendrons, and stone terraces encircle this completely renovated Arts and Crafts home, mere moments from the train, downtown Princeton, and top public and private schools that include its esteemed University. Day-to-day comfort and impressive entertaining are both easily handled, thanks to thoughtful updates like upgraded electrical and HVAC, a state-of-the-art kitchen, stunning baths, game room and gym - all accomplished without sacrificing the home's hallmark craftsmanship: commissioned Mercer tile floors, a magazine-featured foyer ceiling, and incredible work by local craftsmen. There's no need to get in the car to have a memorable day: simply gather friends and loved ones around the pool, invite neighbors to a pick-up game on the sport courts, and then relax and refuel in the matching pool house. 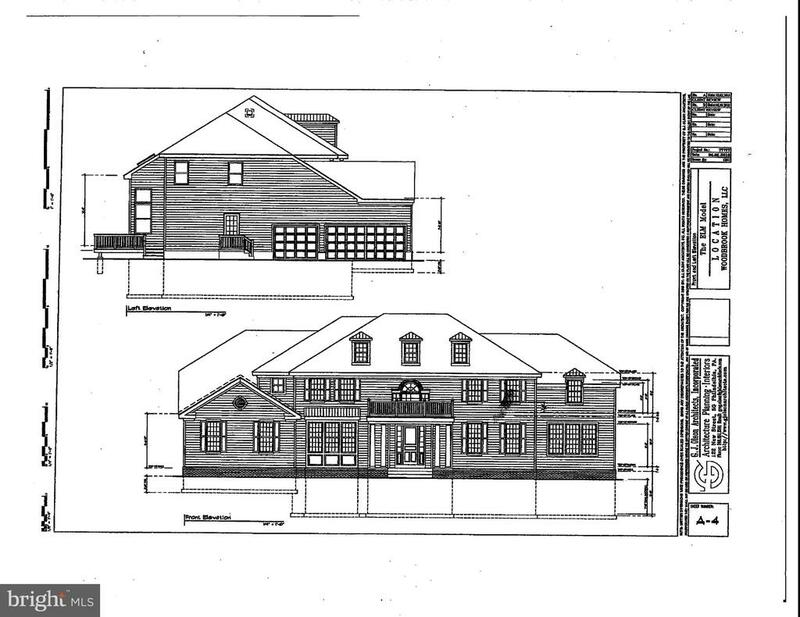 Everyone can stay the night: 6 bedrooms and 5 full baths ensure privacy and room for all. 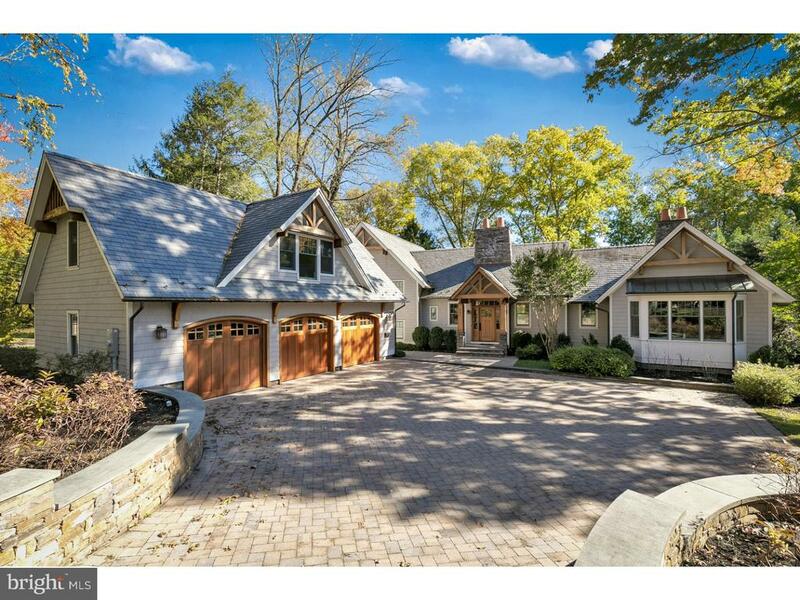 4-car garage"
"A Long Driveway leads to this beautiful custom estate home. Come see this masterful and dramatic all (100%) brick modern construction. (7,276 sq.ft.) 5 extra large bedrooms all with their own baths and walk in closets. Separate/private aupair/inlaw suite. Walk through the custom solid double doors and you will be impressed with the beautiful 2 story foyer and floating staircase & unbelievable moldings. Solid doors throughout. Extraordinary detail throughout. The large gorgeous custom gourmet kitchen enjoys a 2 sided fireplace, 4 dishwashers, state of the art appliances, gorgeous granite and top of the line cabinets provide this large kitchen with the added elegance... plus the added bonus of the adjacent bar area between the kitchen and dining room for formal serving. The main level enjoys the large family room, formal living room and dining room and a wonderful formal office with fireplace. The walk in laundry room is located off the kitchen near the second staircase to the bedrooms and finished 3rd floor. This home offers to the new owners 2 master suites, 2nd can be an in-law or aupair suite. 6 zone HVAC,Brazilian Cherry floors throughout...and on and on. The all brick exterior and electric gate provide beauty on the 2.05 acres with a 800 square foot rear paver0patio. So much more but you must visit to see and appreciate the incredible moldings and doors and detail. You will arrive and drive the long driveway to the beautiful front door and 3 car garage. Fabulous location. Fabulous Princeton home. 14 rooms." 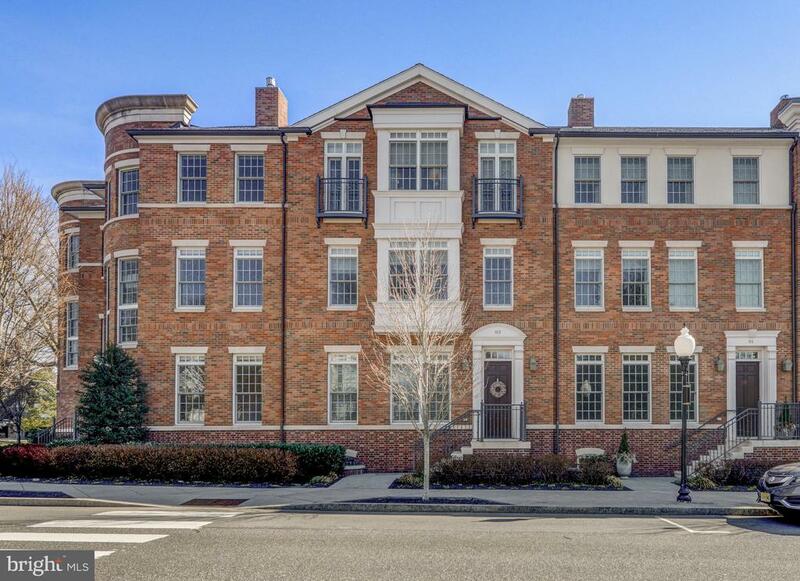 "Rarely Available ~ Situated on the west side of the Palmer Square Shopping & Eateries complex in downtown Princeton, this beautiful 2,850 SF, three bedroom, three and a half bath townhouse at The Residences at Palmer Square offers a convenient maintenance-free lifestyle. Brick and stone facades, custom multi-pane windows, decorative door pediments and wrought iron Juliet balconies blend traditional and contemporary styles to the Colonial and Federal style architecture of Princeton. 10-foot foyer welcomes you to the comfortable home that extends to a gourmet kitchen. Pocket sliding doors frame the spacious living and dining room filled with custom appointments like warm hardwood flooring, comfortable gas fireplace with marble hearth and dramatic crown molding that add style and elegance. The custom designed eat-in kitchen includes granite and natural stone, Viking stainless steel appliances and raised panel rich maple cabinetry. A powder room and a back entrance to the two private parking spaces in a gated area complete the first floor. An elegantly designed staircase leads to the second floor featuring a master bedroom with a spacious sitting area and a walk-in closet. A luxurious bath with marble counter tops, whirlpool tub and glass-enclosed shower provides spa like experience. A den and a laundry room are also conveniently located on the same floor. A private terrace outside the den provides an added benefit of outdoor living and easy access to the center of the scenic landscaped courtyards and stone promenades. Each of the two secondary bedrooms on the third floor has a private bath and generous sized walk-in closet. An in-house elevator leads you to all levels effortlessly. The custom finished basement with a wine room provides additional space for work, relaxation and entertainment. Life at 83 Chambers St offers living in a refined and historic community known for the prestigious Princeton University, Tony Award winner-McCarter Theatre, historical m"
"A circular drive lined by Belgian block leads to a gently curved paving stone walkway. Meticulously manicured landscaping adorns the front courtyard, providing the perfect transition from the chaos of the outside world to the serenity and intimacy of home. A turreted dormer provides three angles from which the sun can hit the dramatic chandelier, dripping in crystals, gracing the two-story foyer. A handsome library features custom cherry bookcases for the bibliophile and architectural cherry wainscoting, lending the room a feeling of both importance and permanence. The formal living room and dining room access the solarium through transomed French doors. The kitchen, taking inspiration from French country design, is elegant simplicity at its finest, right down to the gorgeous Lacanche gas range. The family room is at once impressive and cozy, with a vaulted ceiling, gas fireplace, custom built-ins and French doors to the terrace. Upstairs, the master suite, blissfully bright, has a vaulted ceiling with double arial fans, windows for days and two closets plus a walk-in closet. A second en suite bedroom and two additional bedrooms sharing a Jack-and-Jill bath round out the second level. A portion of the walk-out basement is finished, providing an additional family room, den, kitchenette and full bath. The three-car garage accommodates six cars, with a car lift in each bay." 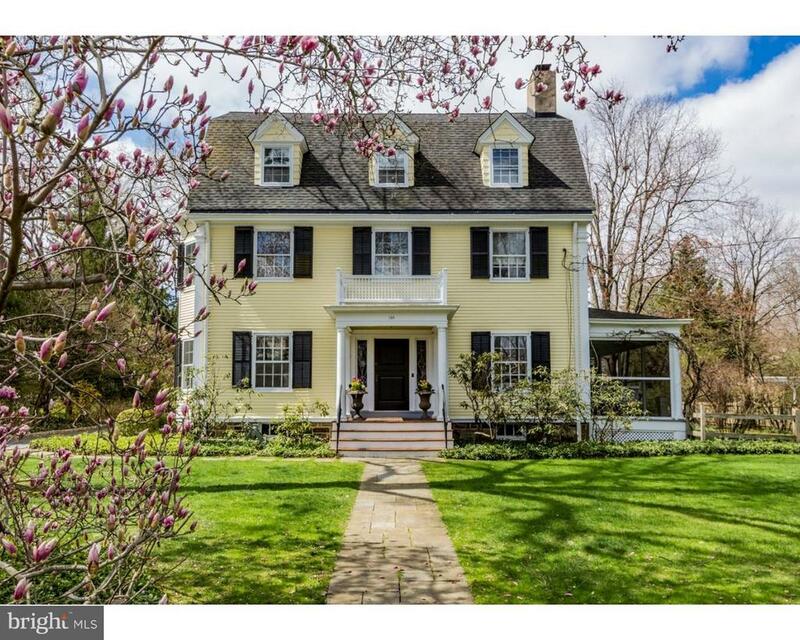 "Embraced by a circular drive, elegant swimming pool, and almost 2 manicured acres bursting with color and texture, this impressive 1926 colonial is a warm and noble presence in Princeton's long-admired Western Section. This original Rolf Bauhan design, with thoughtful improvements by Pierre Coutin, has a lovely balance of intimate and entertaining areas, trimmed in exquisite period millwork, four fireplaces, and French doors. An airy entrance hall with front-to-back light introduces lofty ceilings, and fans to grand dining and living rooms, a mahogany-sheathed library, and a circular conservatory that dazzles with light. A glass atrium enfolds a spiral staircase to a gym and rec room. Beautiful terracotta tiles lie underfoot in the butler's pantry, spacious kitchen, and an expansive family room awash with natural light from skylights and broad expanses of glass that frame the grounds. A lyrical staircase curves toward 5 bedrooms and an office on 2 floors. Moments away, Princeton's downtown beckons with fine shops, restaurants, and theaters. Equipped with a whole house generator." "H.G. Duffield, class of 1881 at Princeton University and its storied treasurer, would be proud to see the refined updates of his home, capturing the beauty of yesteryear while integrating the luxuries of today. This Western Section residence is full of original details that unfold across three floors. Yet today's comforts have been perfectly incorporated including a kitchen and family room renovation and an updated master bath. Six bedrooms, a playroom, and an office span the upper levels reached via sun-infused stairs. The first floor is defined by old-world entertaining spaces including a library, a fireside living room with a screened porch, and a banquet-style dining room. The family room incorporates a casual eating area, built-in media cabinet, and doors to the large fenced yard with a tucked-away pool. The kitchen is a cook's delight showcasing an island, Wolf range, and pretty glass cabinetry. A powder room services this floor and 3 full baths serve ancillary bedrooms. The owner's suite pampers with a spa bath, dual walk-ins, and a dressing room. A nearby study with fireplace is ready for a variety of uses. All of this with immediate proximity to downtown Princeton, Princeton University and nearly everything life in our coveted town has to offer."